Archiving of clinical materials as Formalin-Fixed, Paraffin-Embedded (FFPE) samples is a common practice. However, the methods used for fixation and storage significantly damage and compromise the quality of DNA from these samples. As a result, it can be challenging to obtain useful information, including high-quality sequence data, especially when sample amounts are limited. The NEBNext FFPE DNA Repair Mix is a cocktail of enzymes formulated to repair DNA, and specifically optimized and validated for repair of FFPE DNA samples. The NEBNext FFPE DNA Repair Mix contains enzymes and buffers that are optimized to repair FFPE DNA in next generation sequencing workflow. The mix can be used upstream of any next generation sequencing library construction method, for any sequencing platform. 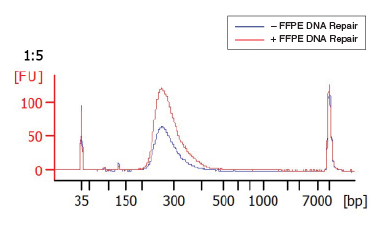 An example of Agilent Bioanalyzer® traces of libraries prepared from stomach tumor FFPE DNA that was treated with the FFPE DNA Repair Mix, or was untreated, before library construction. Yield improvements of 10% to 458% have been observed. 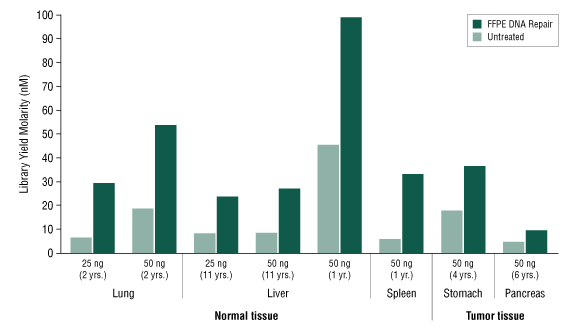 FFPE DNA samples (25 ng or 50 ng) from a variety of tissue types were treated with the NEBNext FFPE DNA Repair Mix, or were untreated, before library construction. 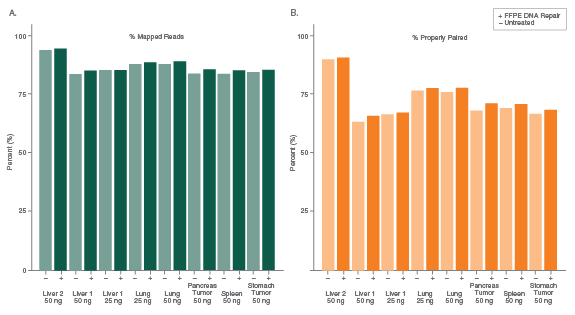 Library yields were measured using the Agilent Bioanalyzer, and ratios of library yields with and without treatment with the NEBNext FFPE DNA Repair Mix were calculated. Yield improvements with these samples ranged from 101% to 458%. Will the FFPE DNA Repair Mix ligate my DNA fragments? Will treating my DNA with the FFPE DNA Repair Mix hurt my downsteam reaction? Will the FFPE DNA Repair Mix blunt the ends of the DNA? Does the FFPE DNA Repair Mix insert random nucleotides into the sequence that it repairs? Does the FFPE DNA Repair Mix remove covalent modifications from DNA bases, such as biotin or digoxigenin? Does the FFPE DNA Repair Mix repair DNA-protein crosslinks? Does the FFPE DNA Repair Mix fix blocked 3’ ends? Can the FFPE DNA Repair Mix repair damage in both single and double stranded DNA? Or, does it require double stranded DNA as a template? If I had a DNA template with mutation sites (ie. 8-oxoguanine or deaminated cytosines) that are directly adjacent to each other on opposite strands would treatment with FFPE DNA Repair Mix cause a double strand nick/break? What gap lengths can be repaired with the FFPE DNA Repair Mix? Can the FFPE DNA Repair Mix repair bisulfite treated DNA? When working with fragmented DNA, will the ends be ligated together by the FFPE DNA Repair Mix Reaction Mix? How are abasic sites repaired by the FFPE DNA Repair Mix Reaction Mix? Can I use the FFPE DNA Repair Mix to repair other types of low quality DNA other than FFPE DNA?